Sponsorship deal is viewed as a 'home run' for women’s sport. 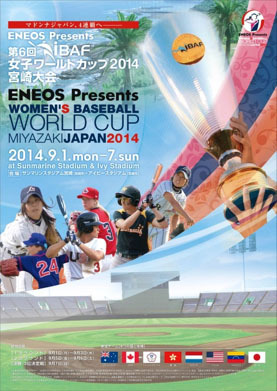 The ENEOS Presents Women’s Baseball World Cup 2014 will be held in Miyazaki, Japan, from 1-7 September, and will include the women’s baseball National Teams of Australia, Canada, Chinese Taipei, Hong Kong, three-time defending champion--Japan, Netherlands, United State and Venezuela. The sponsorship agreement includes cash remuneration, which will also place the ENEOS brand on the logo of the premier women’s baseball event in the world. In addition, the Japanese oil giant will have a presence around the two site venues in Miyazaki, as well as across the event’s digital/web platforms and in all of the WBSC’s forthcoming communications and announcements related to the event. The oil giant returns after being a key sponsor of the III Women’s Baseball World Cup, which was held in Japan in 2008. WBSC officials are delighted that the ENEOS brand, which has several successful partnerships across motor sports, including high-profile sponsorships for Formula One and NASCAR racing teams, has expanded its portfolio to include the ENEOS Presents Women’s Baseball World Cup 2014. The addition of the Women's Baseball World Cup to the ENEOS stable of blue chip sports sponsorship events also highlights the growing global community, and commercial interest and participation of women in bat and ball sports more generally, in softball as well as baseball. “The WBSC is very proud to have a partner such as JX Nippon Oil and Energy and the ENEOS brand to support women’s excellence in sport and to deliver the best-ever Women’s Baseball World Cup in Miyazaki,” said the WBSC President, Riccardo Fraccari. "The support and sponsorship of such an iconic Japanese brand has great potential to further raise the profile and appeal of women's sport in the eyes of other major brands and broadcasters. And, we are very humbled to try to play whatever role we can to help increase opportunities for women through WBSC’s sport disciplines,” said the WBSC president. “Through baseball, we will continue to do social development and support the growth of the next generations." JX Group has a strong tradition of finding value in supporting baseball at the national level in Japan. The Japanese oil giant continues to sponsor initiatives that target people with disabilities, youth and women to encourage them to play baseball and become empowered through the team sport. The recently elected WBSC leadership has made it one of its chief priorities to promote gender-equality and to provide more opportunities for girls and women to be empowered through sports that women like to play, like baseball-softball -- and to harness the skills and leadership of women across all levels of WBSC’s decision-making structure. "The WBSC shares and supports the Olympic Movement's focus on boosting the number of women in sport, and we are working hard to promote the benefits of sponsorship of women's sports in baseball and softball to major companies in order to help achieve a sporting landscape that is more relevant to women,” said WBSC Secretary General Ms. Beng Choo Low, who is also a member of the International Olympic Committee’s (IOC) Women and Sport Commission. The WBSC, along with other world sport governing bodies, is hoping for the opportunity to be included in future Olympic Games, pending the outcome of the Olympic Agenda 2020 review. "It would be the highest possible honour and privilege for baseball-softball to serve under the Olympic umbrella, as an Olympic sport. This would significantly boost and harmonise our efforts in relation to increasing resources and opportunities to help more women and young girls participate in sport, from the playground to the podium, and in administration and coaching and other key sporting infrastructure roles." ENEOS is the corporate brand name of JX Nippon Oil & Energy Corporation, the largest oil company in Japan. ENEOS brand motor oil is developed to exceed the highest standards of the automotive industry. ENEOS product ranges from motor oil that offers optimal performance protection under the most extreme temperature variations, to ecologically friendly motor oil that provides superior fuel saving capacity. JX Group conducts business based on respect for five key values, abbreviated as EARTH: ethics, advanced ideas, relationship with partners and society, trustworthy products and services, and harmony with the environment. For more information please visit http://www.noe.jx-group.co.jp/english/.